Children are often ignored in disaster related planning and policy development. This collaboration between Lancaster University and Save the Children researched children and young people’s experiences of the UK winter 2013/14 floods. The BDMA has been delighted to support this initiative and raise awareness of the particular needs of children and young people in the aftermath of flooding. The presentation by the project leaders and children from South Ferriby School, at our 2015 Conference, made a significant impact on the audience and the project outcomes continue to inform our members and the wider industry. One in six properties in England is at risk of flooding, with more severe events expected over the coming years. It is therefore inevitable that many children and their families will be affected. Lancaster University and Save the Children have prepared the following 10 Tips on how to support children affected by flooding for those working in the insurance, loss adjusting, property claims and damage management sectors. 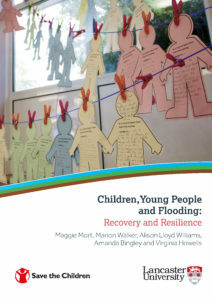 These are based on our Economic & Social Research Council funded research, Children, Young People and Flooding: Recovery and Resilience, aimed at understanding the effects of the 2013/14 winter floods for children and bringing their insights into flood risk management. Drawing on the Children’s and Young People’s Flood Manifestos, we invite the wider insurance industry and its supply chains to take account of the needs of flood-affected children and to respond to concerns they have raised through this project. 1. When you visit a house, pay attention to what children and young people are saying about what the flood means for them. Insurers currently attend to family and community needs: children are missing from your overall strategies. 2. Be aware of the adverse effects that the long-term recovery process has on all flood- affected children and young people, both those living in insured and uninsured homes. Flooding causes significant disruption to children’s lives at home, at school and in their community. Take into account the extra financial costs for families of e.g. transport to school or eating expensive unhealthy fast food due to lack of access to cooking facilities. 3. Think about the social and emotional ‘costs’ for children, such as the loss of toys and personal items, not being able to meet up and play with friends, and distress at being in a strange environment. Remember that children and young people are likely to endure a lengthy period of living with uncertainty long after the flood event. 4. Provide more child-friendly information about what people can expect from insurance companies, and how they can hold insurers to account. For example, provide families with more guidance about the drying process so that people don’t return to their homes too soon. People living in bungalows, ground floor and rented accommodation are particularly vulnerable and would benefit from specific, targeted advice. 5. People with disabilities may require additional support if they have to relocate as a result of flooding. This includes identifying accessible hotel and temporary accommodation. It may also involve help with travel to regular health service appointments, or supporting those with learning difficulties to maintain regular routines. 6. Recognise that your frontline workers need support. They work long hours on the ground with people who are angry, upset, confused and displaced and the emotional labour of this role is extremely draining. Children notice and are affected when adults (e.g. parents, insurers, loss adjusters, damage management technicians) around them are under intense pressure. 7. Flood-affected children also understand the need for adaptation. Rather than promoting ‘back to normal’, please support them when they say ‘we need a NEW NORMAL’. Young people can be powerful allies with the insurance sector and help raise public awareness of flooding, preparation and adaptation. 8. Where tenants are not in a position to install flood resilience measures, the sense of insecurity for children is increased. Insurance companies could better support the development of regulations to require private landlords, utility services, the building sector and local authorities to implement flood resilience measures. 9. Children and young people affected by flooding comprehend the high future risk and have said that building developments such as housing and schools need to be flood resilient. This affects children’s futures and the insurance sector can support them by lobbying for this change. 10. Be aware that contradictions between insurer practices cause added stress to families. Problems include disposal versus restoration, and ‘like-for-like’ versus resilience building. Insurers can address this by working for high level policy shift to support flood resilience measures.